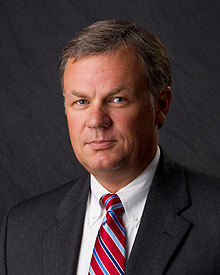 Born and raised in Morgan County, Scott Anderson was elected to serve as the District Attorney of the 8th Judicial Circuit of Alabama, in 2010, and took his oath of office on January 17, 2011. Prior to serving as district attorney, Scott maintained a private law practice for 19 years. In his years of private practice, Anderson represented clients in civil, domestic relations, and criminal cases. Anderson appeared in various courts all over the state of Alabama and served as counsel in a number of capital murder cases. In addition to his private practice, Scott also served as a municipal prosecutor from 2000 to 2010. Scott is proud to be a product of the public school system of Morgan County. He graduated from Austin High School in 1983. As an undergraduate, Anderson graduated in 1988 from the University of Alabama with a degree in business. He obtained his Juris Doctorate in 1991 from Cumberland School of Law at Samford University in Birmingham, Alabama. Anderson is a member of the Alabama District Attorney’s Association, serves as the President of the Board of Directors for the Morgan County Child Advocacy Center, and is a proud member of the local Fraternal Order of Police. Scott is married to Cindy Segars Anderson and they have three children. Scott and his family worship at First Bible Church of Decatur.